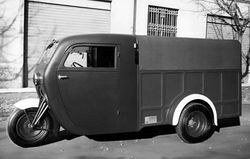 Fabbrica Candele Accumulatori Maserati S.p.A. (1947 in Modena - 1960) was an Italian manufacturer of motoring components (spark plugs and accumulators), as well as mopeds and motorcycles. It was part of Adolfo Orsis large industrial corporation (which included the Maserati car manufacturer), that was divided among siblings (1953). His sister Ida Orsi received over the component branch that was not doing well at the time. 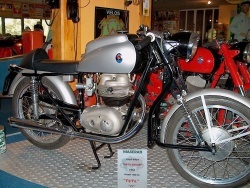 By purchasing the Bologna-based motorcycle manufacturer Italmoto (1953), the company entered a new market and sold well locally and had an export line to South Africa, Europe and North America as well. 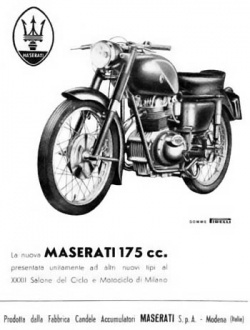 The products was allowed to continue the use of the well-known of Maserati and the trident trademark. 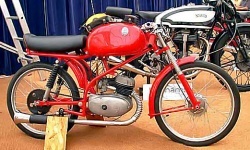 Production ended due increased competition from other manufacturers (Morini, MV Agusta, Benelli and Laverda), as well as financial troubles that also hit the car manufacturer. 125/L/T2 DKW-inspired engine, later T2/TV and T2/GTS (a racing version that also participated in Formula 3 racing, 1957). 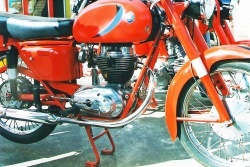 minor prototypes and series were based on 75 ccm, 175 and 250 ccm engines.